Does your transmission have strange problems with the shifting and unexpected error messages on the dashboard? The shift solenoid is a part that is causing a lot of strange problems in automatic transmissions. There are a few ways to find out if your shift solenoid is bad. Replacing a shift solenoid is often costly so you want to make sure that you are not replacing a functional shift solenoid. In this guide, you will find everything you have to know about transmission shift solenoids. How to locate the problem and replace the parts. What is a transmission shift solenoid? The transmission shift solenoids job is just like it sounds – shift the gears for you. The transmission control unit is getting information from the engine, vehicle speed sensors, and other parameters. The engine is using all these parameters to calculate when it’s time to shift. When it’s time to shift, the transmission control unit sends out power or ground to the required shift solenoid and it makes the solenoid to open and let the transmission oil flow into the valve body. The shift solenoids are spring loaded with a coil inside. Depending on the car, but it normally has 12 volts to the solenoid all the time and the transmission control unit is sending ground to the solenoid when it’s time to open and releasing the pressure. If the transmission control unit won’t be able to open the shift solenoid with help of the power or ground, it will store a trouble code in the transmission control unit on the affected shift solenoid. It’s also possible that the shift solenoid has an internal problem or is stuck to the transmission control unit can’t open it properly. There are a few different symptoms of a faulty shift solenoid. In the table below, you will find the most common symptoms, causes, and fixes. However, it’s always recommended to do proper research about the problem and not just replace parts from the list. The most common symptom of a damaged transmission shift control or wirings is a warning light on your dashboard. This is often lightened up by a Check Engine Light or a Transmission warning light. If you see a warning light on your dashboard, read the trouble codes with an OBD2 Scanner and start your troubleshooting there. How to diagnose a shift solenoid problem? First, we have to figure out if it’s a wiring, shift solenoid, TCM or mechanical fault. To do so, you should read and research the trouble codes carefully to understand the problem before starting the troubleshooting. If the trouble code is telling us that it’s a stuck or electrical problem it is most likely a wiring or shift solenoid problem. A lot of the shift solenoid codes could be solved by trying to make a transmission fluid replacement or a transmission flush to your transmission. A transmission fluid change is often not that expensive and it can solve a lot of problems with your transmission. Here is a list of the most common problems regarding shift solenoid problems. If you get an electrical or stuck code, the easiest way to check this is with an OBD2 reader with the function to test the shift solenoid by forcing the transmission control unit to open and close it. If you do not have an OBD2 reader with this function at home, you can lend one or check out our article OBD2 Scanner Reviews. Find a transmission wiring diagram for your transmission. Find out which pins that are going to the affected shift solenoid. 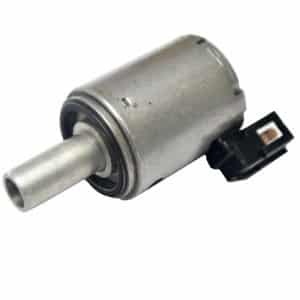 Measure that you get both 12 volts and ground to the shift solenoid at the plug on the transmission on the affected pin. If you do not get both 12 volts and ground – you may have a wiring problem or a faulty TCM ( Transmission control unit ). If you get 12 volts and ground and the shift solenoid trouble code keeps coming back after you erased it, you do probably have a faulty shift solenoid. How to repair a transmission shift solenoid? If the shift solenoid itself has an internal error, the best way is to replace just the shift solenoid is possible. In some cases, you can clean the shift solenoid if you find a lot of dirt inside of it. As I mentioned before, a transmission fluid change or a transmission flush can solve some shift solenoid trouble codes if you want to try it out first. To replace a shift solenoid, you have to remove the transmission fluid pan to reach the faulty solenoid. It is located in the valve body. NOTE: In some vehicles, you can’t replace just one solenoid, you have to replace the whole solenoid pack. Always check this with your dealer before you are starting to remove the transmission pan. The replacement cost of a shift solenoid replacement is depending a lot on what car model you have. As I mentioned before, in some cars you can’t replace just one solenoid. You have to replace the whole solenoid pack and that is often expensive. When you are replacing a shift solenoid or shift solenoid pack, you should always also replace the transmission fluid and filter is located. The price is also affected a lot depending on what parts and transmission fluid you are using. Aftermarket parts are often cheaper than original parts, but often not with the same quality. 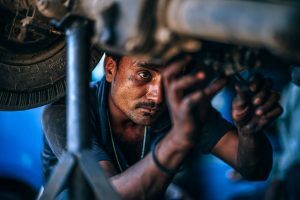 A lot of shift solenoid problems can be solved by changing the transmission fluid and with the help of a transmission flush to get all dirt out of the solenoid pack. If you can’t just replace a single solenoid, and you have to replace the whole pack, it could be worth trying to change your transmission fluid first instead. You should always make sure that there is not a wiring problem between the transmission control unit and the solenoid before replacing any parts. If you need help with other transmission related problems, you can check out our Transmission problems repair guide or our other transmission articles in the category. If you do still have any questions about the shift solenoid that you want answers for. Comment down below and I will answer them as soon as possible. If you have other car questions you can go to our homepage and ask a mechanic for free. Hi, i have a solenoid b fault on my 2004 Ford focus. Would replacing the gearbox fix this issue? In a lot of automatic transmissions, you can replace the solenoid or so-called the whole solenoid pack. It’s recommended to measure the solenoid with a multimeter from the transmission control unit connector to check if there are any open circuits, take help of a wiring diagram. If you see an open circuit, measure the same wirings on the transmission, if this line is okay, check the wirings between transmission control unit and the transmission. If you do not know a lot of car electronics, I can recommend to let a good mechanic measure it before replacement of the solenoid pack or transmission. If I am buying a used car – Ford Escape 2015 that had it’s shift solenoid replaced at 36,000 miles….the car now has 50,000 miles on it…. should I be concerned about the transmission?…. any recommendations? Make a proper test drive and see if there is any strange symptoms or noises from the transmission. If you can find any noises or problems I would recommend you to not purchase it! Hi i have a fault code P0731, P0750, P0753 on my Ford Mondeo faulty solenoid A circuit. My car is a 4 speed CD4E and i am looking to change the solenoid block. What is my best option either to change the atf or the solenoid altogether. Thank you. 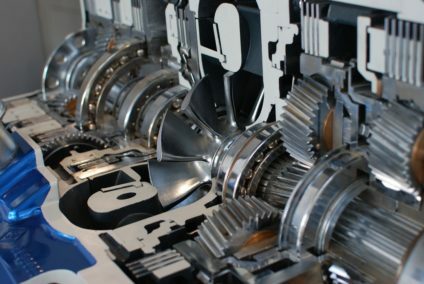 If you can find a used transmission in a good shape it’s of course a good option – The downside is that you can be unlucky and get a bad one. If the solenoid block is faulty, it’s probably the best way to replace it instead, but you have to be sure that there is no other problems with the transmission. Thanks for your website! Have a 2005 GMC Sierra 1500 with 4L60E trans with 160k miles and never changed fluid (my bad, the only thing I don’t maintain). Thinking of changing fluid and filter shortly with a pan drop. Having zero issues with trans. Should I change the shift solenoids while the pan is dropped or leave it be? Any other advice you can provide will be greatly appreciated. My lock up Solenoid seems to get busted or dead very oftenly on the shift Solenoid (lock up) type only when replacing the old busted one and after four days it again got busted or malfunction again . Could it be a electrical short circuit on the plug in the solenoid which is connected with three solenoids in series on my A343F Transmission on my Toyota Prado Tx, KZJ95 model . Please do let me know the reasons quickly ! It could be, but it’s most likely bad wirings then, depending on which trouble code you are getting. If you got the trouble code number, please post it here. Are the codes that the auto parts store printed out for me when I pulled up with the wrench symbol showing for my 2016 ford fusion se. Drove it home had some transmission hard shifts later that night and the next day the car would not go into gear. Had it towed to a mechanic who called and said the transmission would need to be replaced and that their code reader said there was an internal transmission failure and that is what caused the other codes to show up. How true is this statement? Also before sending it to the mechanic shop i drained and replaced the transmission fluid. It was more dirty than expected for just draining it less than a year ago but still pink, not burnt and no metal shavings noticed. Any help would be appreciated. In this situation I would ask a special transmission workshop if you know any. 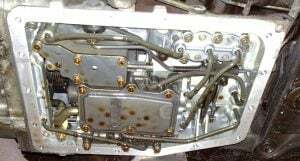 Before replacing the transmission you have to measure the wirings and checking inside the transmission control unit for any transmission fluid inside it. It sounds strange, but sometimes it will push oil through the harness into the transmission control unit. I would start with a transmission fluid replacement. Heard of corollas before with the P0741 code which got fixed by a fluid replacement! I have a Buick lacrosse 2010 cxl…I need to replace a transmission shift solenoid 5 but how to know what’s it’s the numnber 5 solenoid..
You do either need a wiring diagram for that specific model from the transmission control unit to the shift solenoids, or unplugging one solenoid at a time and check which trouble code you are getting, with this method you can recognize it easily! Hi, I’ve bought a ford explorer 2005 with 200k miles on it. The transmission doesn’t shift the gears (only one forward gear and the reverse is working). If I put it in reverse the car shakes for a second. In the car the “serve engine soon” and “O/D” lights are burning. When the car is in neutral there is a medium/light knocking on the right side (almost where the passenger airbag is). And last: if I put the car in “drive” and put my foot off the break – pedal (and don’t push the gas pedal) it will (almost) not move forward. So my guess is that the shift is worn down but ok? And that the major problems are coming from a broken shift solenoid or a bad wire? Yes the easiest way to figure this out is to read the trouble codes and see if there is a problem with a shift solenoid. Check the condition of the transmission fluid also and replace if it’s very dirty. However the easiest and cheapest way is to read the trouble code memory first.